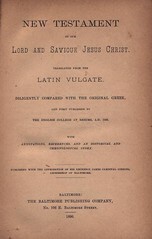 Title New Testament / of Our / Lord and Saviour Jesus Christ / Translated from the / Latin Vulgate: / Diligently Compared with the Original Greek, / and First Published by / the English College at Rheims, A. D. 1582. / with / Annotations, References, and an Historical and / Chronological Index. / Published with the Approbation of His Eminence Cardinal John McCloskey, / Archbishop of New York. / New York: / Robert Coddingon, / 246 Fourth Avenue. / 1882. Contents The Rheims New Testament as revised by Challoner. Title New Testament / of Our / Lord and Saviour Jesus Christ. / Translated from the / Latin Vulgate. / Diligently Compared with the Original Greek: / and First Published by / the English College at Rheims, A. D. 1582. / with / Annotations, References, and an Historical and / Chronological Index. / Published with the Approbation of His Eminence James Cardinal Gibbons, / Archbishop of Baltimore. / Baltimore: / The Baltimore Publishing Company, / No. 106 E. Baltimore Street. / 1890.